Most professional game producers don't think of Director when they consider a development system for their next project, but there is a definite subset of Director users who specialize in creating games. 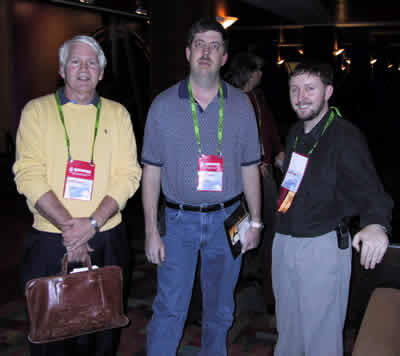 The Game Developers Conference 2003 was held the first week of March at the San Jose Convention Center. While most of the attendees were there to develop games in C++ and Java for a variety of platform (ranging from mobile phones to computers to PS2 and Xbox consoles), there were some hardy Director souls who got together on Friday evening -- the next-to-last day of the conference -- to talk about games, Director, Macromedia, and whatever else came to mind. (from left to right): Steve Bullock, Clint Taylor, and Brian Robbins.